This has to be the worst movie I have ever seen. It looked to me like the actors were in it just to cash a check. We should of walked out and tried to get some of our money back. My advice to anyone thinks about seeing this film, stay away. This movie was horrible! We walked out after 30 minutes... 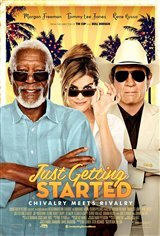 I've never seen bad acting from Morgan Freeman until now. But then again the dialogue he had to work with was atrocious! Tommy Lee Jones didnt do much better with his lines. The only reason this movie made the theaters is becsuse of the star power.This movie was a waste of time! Really disappointing, not well done at all. Surprised the two stars would even associate themselves with this It will disappear from the theaters quickly. Exoected a great movie. I was disappointed. i walked out of this movie after 20 minutes, and received a free courtesy pass from the Theater. it should have been rated "R". I would not want my 13 year grandchildren to see this movie. Shame on Morgan Freeman. The premise of 80/90 year old men with 70/80 floozies pretending that they still had some charisma. I was bored after 30 minutes so I walked out and got my money back. This one was made strickly for the money not for the story line. Shame on you. A few chuckles but if I would have to pay full price this would not be movie of choice, lot of old time good actors and actresses but the movie not that good at all, wait until it comes out on Netflix or TV don't waste your time or money. Horribly written, slow moving throughout, never will understand how Freeman and Lee agreed to the script, no real plot, 1st grade writing. We left 1/3 of the way thru. Horrible and waste of money.